Trade agreements are about more than business—they’re about who has final say in the way people around the world live, what they eat, how much they are paid, what medicines they can buy and whether they have jobs. Such agreements shape economic policies that impact billions of people. The discussions surrounding these agreements are far too important to done in secret. But that’s precisely how the Obama administration is trying to pass the Trans Pacific Partnership (TPP). Proponents of the TPP argue that the agreement will encourage global economic integration, increase U.S. competitiveness in a “dynamic Asia region” and stimulate political reform leading to more “open” markets. All this, they claim, will result in better jobs, wages and products. The Working Families Party of New York has expended considerable effort organizing in Jackson Heights, a diverse, largely immigrant section of New York City, to pressure local Rep. Thomas Crowley. Crowley is a very influential Democrat on the Ways and Means committee who has been evasive about which way he will vote on the issue. According to Cantor, similar efforts to convince reticent politicians of the agreement's dangers have been strong nationwide. In Oregon, the WFP has been working to persuade Senator Ron Wyden, a Democrat who has historically supported free trade agreements, to “shift his position” on the issue. Labor unions, community organizations and Nobel laureates don’t often share a public school auditorium, but that was precisely the constellation of characters that gathered on a recent Wednesday night at P.S. 69 in Jackson Heights to discuss the potential ramifications of the TPP, which is slated for congressional fast-tracking. Around 400 people attended the community meeting, organized by a variety sponsors, including the WFP, Make the Road New York, Communications Workers of America (CWA), Terraza 7 (a local bar and community space) and others. The crowd of unionized workers, small business owners, activists and local residents filled the elementary school auditorium to discuss the implications of the trade agreement and hear Joseph Stiglitz’s remarks on the agreement. Within the economics discipline, Stiglitz, a Nobel Prize winner in economics and Columbia University professor, has been one of the TPP’s most outspoken critics. A fundamental component surrounding the TPP debate is the process by which the Obama administration is trying to have it approved called fast tracking, a procedure for Congressional approval of international trade treaties. Unlike the standard procedure to pass a bill, by which members of Congress debate and deliberate on specific provisions, fast tracking allows Congress to vote “up” or “down” on the trade agreement without making any amendments or opening any of the specific provisions. While advocates of fast track argue that the process provides the president with a necessary strong mandate when negotiating international agreements, Stiglitz found that mandate problematic. “There is a great deal of secrecy.” The U.S. trade representative hasn’t allowed some members of Congress to review the deal’s content. “It’s much worse than a blank check about trade," Stiglitz said, "because the trade agreement has provisions that would affect a whole set of regulations that would affect the environment, worker safety, consumer safety and even the economy." TPP "would not only become the law of the land, but every other law would have to adapt to it ... and our Congress would have given up all authority in those areas. “What are they trying to hide?” he asked. Without naming names, Stiglitz explained that members of the business community have been privy to the agreement and have negotiated on the behalf of private interests rather than the public good. He explained that the content of the TPP does not emphasize the traditional concepts of trade agreements, such as lowering tariffs and increasing imports or exports. Instead, the TPP seeks to undermine regulations in sectors like food safety, medicine and intellectual property, rendering governments and the citizenry that elects them inept in their ability to meaningfully regulate those sectors. By entangling such provisions with an agreement on international trade, the Obama administration would open up sovereign countries to unprecedented levels of interference by multinational corporations. As a cautionary example, Stiglitz contended that countries which had been ravaged by globalization, seeing massively expanding inequality like Brazil and India, refused to join the trade agreement. At the conclusion of the speech, audience members asked about the mainstream media’s silence on the agreement and the TPP’s potential impact on the environment. He opined that the media coverage would likely increase as the decision drew nearer, but emphasized the role that organized mobilizations could play in increasing visibility. On the environment, Stiglitz explained that the regulatory clauses in agreement could be disastrous as countries would lose the ability to regulate multinationals in sectors that could adversely impact profits. Mala Huacuja del Toro was at the meeting with Somos Los Otros New York, an organization that grew out of the reaction to the recent mass murder of Mexican students. 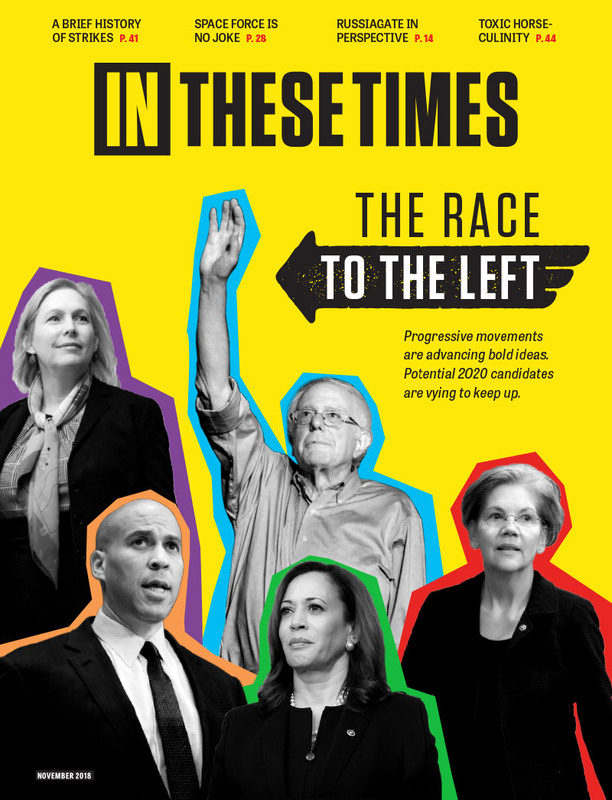 Full disclosure: The CWA is a sponsor of In These Times. Sponsors have no role in editorial content. Another crappy ad to sell to ignorant people. Fortunately most people want honest reactions to the news, which this essay was addressing and can X this crappy ad out of their lives. In short, this will usher in unbridled multinational fascism, with all 'participant' governments under the control of thieving, lying, environment-destroying, human rights-hating corporations. What could possibly go wrong? Just the fact that this treaty is being made in secret is reason enough to be opposed. This may be a test of democracy that hasn't been seen before. Is this a power grab to rule the whole world? Everyone should look to see what's going down. Effectively, we will become Greece (seriously negative trade balance),with the exception that we print, rather than borrow money. Without dependable jobs, we as individuals will be forced to borrow our spending power. It creates an aristocrat and serf economy. The one item the Fed is ignoring with respect to avoiding deflation. With low interest rates, Capital has a small plate at the table. Profits are either going to the owners via stock buy-backs or dividends, to management in the form of excessive compensation including stock options, or to the workers as wage increases (not) OR lower prices which increases consumer spending power thru competitive deflation. Competitive deflation is not meant to benefit workers, it is a means of retaining market share by business in a stagnant economy. While prices may be sticky, they are discounted using sales, give backs and double coupons or best of all, subprime debt with extended terms that effectively doubles the price of a product, like an automobile. Target resisted price deflation and consumers stopped shopping there. Call it what it is: a treaty. Then remember the Constitution, and demand that it be subject to a vote in the Senate and pass only with 2/3 approval. We already know Free Trade treaties result in massive offshoring of US industries and jobs. This creates immediate hardship and long-term loss of the ability to create wealth in the USA. Loss of tax base also results in the fiscal crises we see at all levels of government. Beyond the economic damage these treaties have brought, they also offshore our sovereignty itself, destroying democratic governance by elected representatives accountable to the people. These treaties replace national sovereignty and American democracy with global governance via corporate-written treaty law permanently out of reach of elected representatives of the citizens. If America's politicians weren't bought off by globalized corporations, we'd have a completely different trade policy. When will the American people demand that the executives and agents of globalized corporations and banks --enterprises openly managed with zero loyalty to the USA-- be barred from intervening in American politics and made to register as the foreign agents they really are? We need to build into trade deals the legislation to protect our workers; we need compensation for job loss providing education and income for decades; we need federal laws overturning right-to-work nationally, and giving unions new powers to organize. Just opposing is not good enough -- let's have an agenda. You want free trade -- we want such and such and such and such. You want trade give us this and this. This being against stuff is too much like the Republicons! When Joe Stiglitz speaks, people should listen.